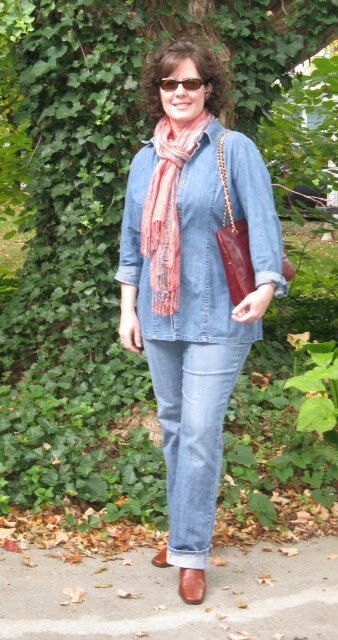 It’s finally starting to feel like fall and that has Adrienne of The Rich Life (on a budget) and me thinking of autumn colors, so for this month’s “How I Wear My” post we decided to focus on two of them, Burgundy and Bordeaux. Both seem poised to be big hits this season. I got several emails from ladies who said they don’t have either of these shades in their closet. This goes for me as well! When that happens I usually turn to nail polish, because I think of it and use it as an accessory and it’s an easy way to add a particular color to a look without spending very much. Which is how I ended up with this Tom Ford nail polish called “Bordeaux Lust” that I bought at Bergdorf’s at this year’s Fashion’s Night Out. Okay, at $30 a bottle, Tom is not budget friendly, at all, but the formula applies so well, this is such a gorgeous classic shade, and has been very long-lasting, so I can’t work up the guilt. I will get my money’s worth out of this polish! Bordeaux Lust meets Draper Tweed. This is the “Hayley” in Draper Tweed by MZ Wallace. I also remembered that I bought these great Tahari patent loafers last year and I definitely file them in the Bordeaux category (though they photographed bright red). I love me a penny loafer. 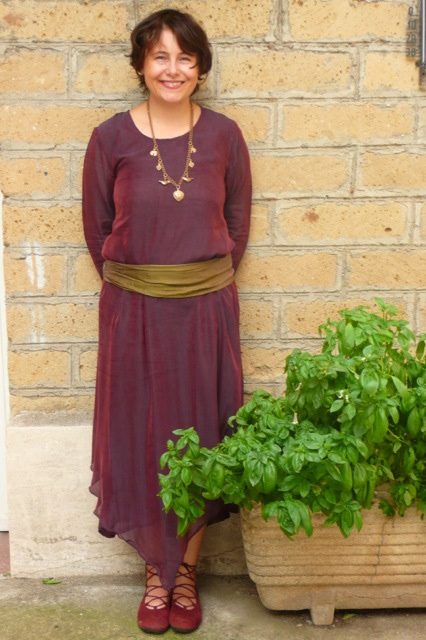 Pam of Over 50 Feeling 40 mixes it up with burgundy and aubergine! Jane of The Navy Blue of India in a jacket that’s like burgundy steeped in chocolate. Amy of Denim & Dots. What a great sweater jacket! Barbara looks so romantic in this ensemble. And is that the lushest basil ever or what? 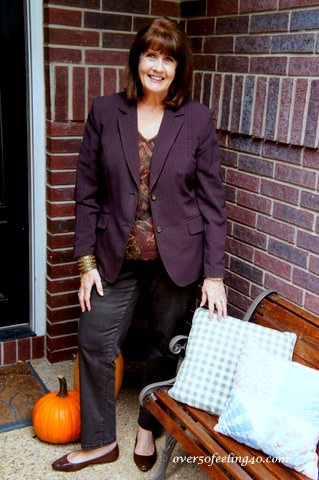 Jeannie of Gracefully 50 in burgundy flower-print pants. Divine! Hang of POUM! La Mode. 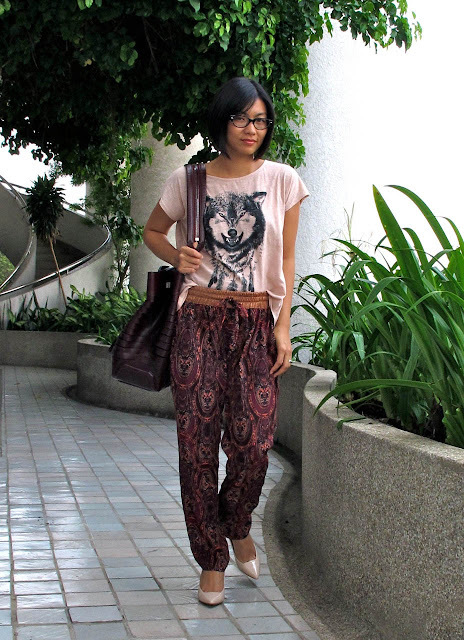 I love the burgundy paisley pants and bag! I am fascinated by this amazing Alexander Wang Mini Golf bag. Heather of Vintage French Chic with a vintage Koret bag I now covet. 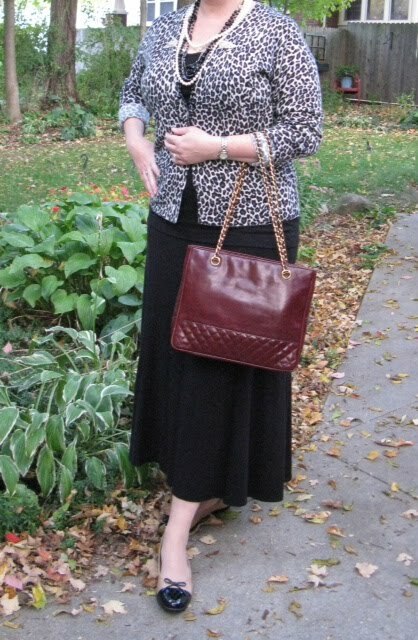 No matter if it’s paired with denim or leopard, Heather’s Koret bag is so versatile and beautiful. Marina of Antares: Alfa Scorpii wearing a lovely bordeaux pashmina. I love this look! 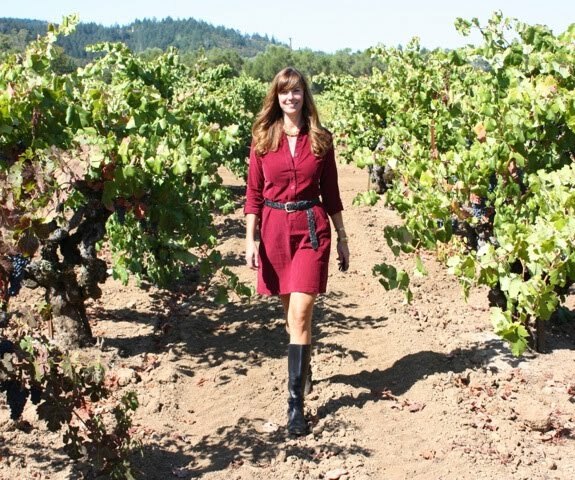 Here’s Adrienne walking through vineyards wearing a fine-wale corduroy shirt dress. Gorgeous! For November Adrienne and I will tip our hats to hats. So find your favorite chapeau and join us for “How I Wear My: Hat.” Send either of us a picture of yourself in your hat by November 1 and we will include you in our post on November 2. 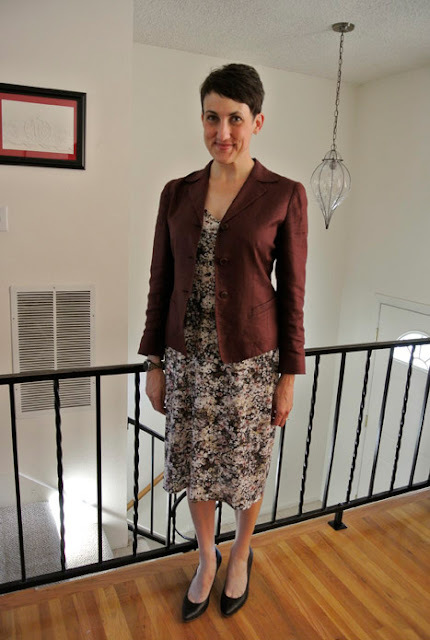 Do stop by Adrienne’s to see what other Burgundy/Bordeaux looks she has put together. I can’t believe it’s been a year since she and I started the “How I Wear My” series and may I say what a complete delight it’s been getting to know her and all of you? Thank you to the fine foxes who make these posts so fun. I raise my glasses of Burgundy and Bordeaux to you! 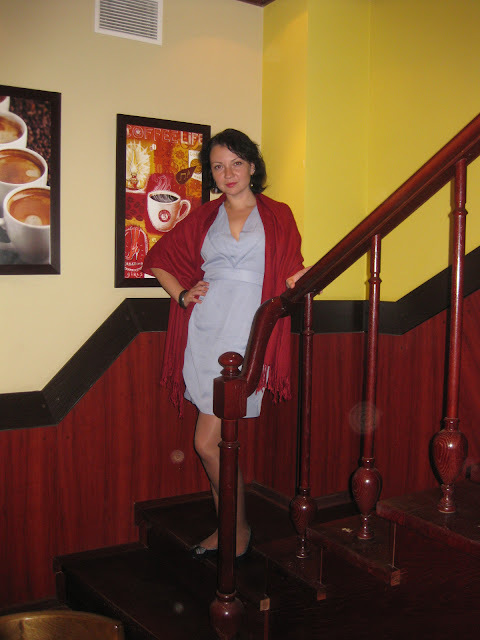 I am off to visit new bloggers. I love that Tom Ford nail color!! Gorgeous and all of the styles are so much fun to see. Between clothing and accessories, this made for a very fun event!! Thanks for including me, Jill! Thanks for having me on your great blog Jill!!!! Everyone looks lovely in their burgundy! Love the nail color...$30? Wow! I don't wear much nail polish so this is really a surprise to me. Cute loafers, too! Love that nail polish and if it stays on, I say it's worth $30! Your loafers are great! I love that you put pennies in them. As usual, a great group of participants with so many different looks and items. Happy One Year HIWM Anniversary, Jill! Who would've thought we'd still be doing this monthly series since our Target-Missoni post? Here's to another year! Love this theme....Bordeaux is such a beautiful fall color. I have that same pair of shoes....but I never thought to put a penny in them! Oh, no. I can't believe I missed this! I had my look already to go, too, but thought it was tomorrow. Boo. You all look so lovely though; I love seeing the different variations of the colors. That nail polish is gorgeous. I do have burgundy in my closet but unfortunately three quarters of my closet is still packed away in storage and all the burgundy is in there! Everyone looks amazing!!! And I love that you put pennies in those loafers. And you muslin? How is that going? Gorgeous shades of fall indeed. Thanks for hosting this fabulous post. I also enjoy reading your contribution on Clothes on films. Such inspiring! I love the costumes in W.E too! So late in the game- but yyou all look so quaffable! Love wine hues so perfect for fall. My new boots would fall in this catagory- haven't photographed them yet- still getting unpacked (ok not completely moved in yet) from move. But hats! I'll try for Nov 2.